Due to backwardness of Bihar and Jharkhand States, women are always given secondary status he re. The primary unit- family itself does not respect its female members. They are treated as a curse and a woman reproducing a girl child is looked down upon. Gram Sathi with the financial support of NABARD, tried to break this hegemony by the socio-economic empowerment of the poor women through SHG. SHG formation and nurturing has been a focused program of Gram Sathi and with the support of NABARD, we have successfully formed 300 women’s SHGs in Godda, Banka and Deoghar districts in Bihar and Jharkhand. 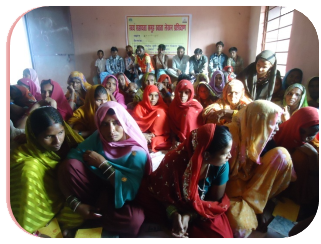 Apart from the group savings and internal lending, regular capacity building training programs by Gram Sathi helped in improving the capacities of the formed women groups in management of the group affairs, process of bank linkage and EDP, problem solutions, literacy promotion and awareness of different govt. schemes and programs. It is a fact that sustainability of micro finance in SHGs based upon proper book keeping and efficient fund management and therefore identification of potential book writers in the groups and training them for maintaining the accounts as per the standard norms are important for SHG progress. Essentialities and common errors of book keeping and financial management. Benefits of organizing SHGs meetings on weekly basis, maintenance of own saving passbooks by the group members, internal group lending process, maintaining a clear and transparent cash management and linking all the groups with banks to avail bank loans for self-employment. The training showed a good results and the SHG members have now better know how on account writings and on the functioning and different rules and regulations of the SHGs that helped them to move towards socio-economic reliance.